GARAGEMag.com is live-streaming from FOLD Gallery in London, where Alexander Costello, William Mackrell and Florence Peake will be performing or coordinating performances in the gallery for the evening of the private view. 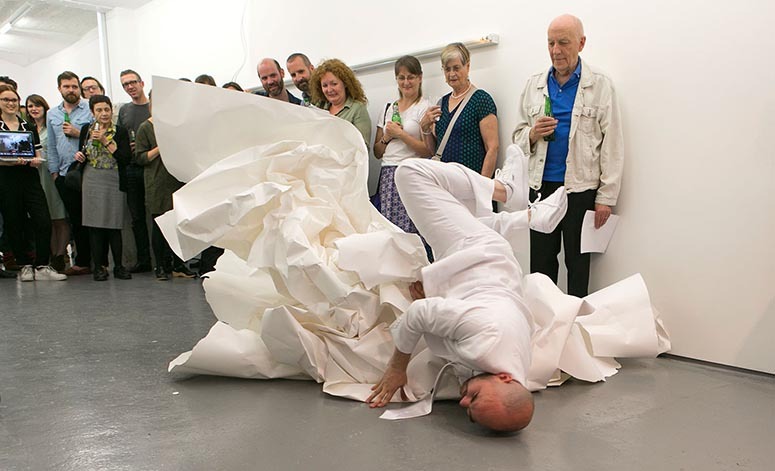 The result will culminate in a show of objects, interventions and sculpture which will remain exhibited in the space for the duration of the show. Sculptor Ana Genovés will provide an object for Sarah Jones to interpret in sound, reading it like a score. Jones will continue to visit and attend to Genovés’ work throughout perFORMa, which runs from Saturday 18th July to Saturday 8th August. perFORMa aims to rebuild the bond between performance art and material art, by exhibiting the objects that result from various performances.